Faced with a big increase in its homeless population, the City of West Hollywood has stepped up its efforts to address the issue. Today the city has announced the launch of a pilot program that provides outreach and services to homeless people at West Hollywood Library. Recently City Manager Paul Arevalo announced that he was asking Social Services Supervisor Corri Planck to take on the role of coordinating the city’s homeless efforts. The pilot program, which actually began in October, makes it possible for homeless people to meet at the library during certain hours with organizations with which the city has contracted to provide services. Those organizations provide an array of services, ranging from housing and shelter to mental health and substance abuse treatment. An on-the-street survey in January 2016 found 87 homeless people in West Hollywood, a significant increase from the 43 counted the year before. That survey, while not an accurate count of all homeless people in West Hollywood, reinforced the perception of residents that homeless has been on the increase in WeHo. This year’s survey will take place Jan. 26. 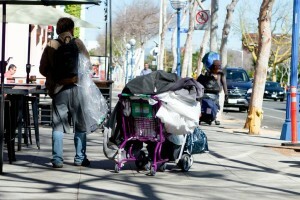 In September the West Hollywood City Council passed a resolution proposed by Mayor Lauren Meister and Councilmember John Heilman to form a council subcommittee focused on homeless issues and to reaffirm the city’s willingness to work with countywide agencies on the issue as well as concentrate on preventing West Hollywood residents from becoming homeless. One of the issues, Planck explained, is that the presence of homeless people in West Hollywood can’t be solved by the city alone, given the ease with which people can cross the city’s boundaries. That’s one reason why West Hollywood is working with countywide agencies on the problem and why a recent meeting of the Westside Council of Governments had three items on its agenda about homelessness. Another issue is that homelessness can be the result of several different factors: poverty, mental illness and drug addiction, among them. Mondays. Ascencia, a Glendale-based organization that offers shelter and other services. Available 10 a.m. to noon. Tuesdays. The L.A. LGBT Center‘s Youth Services and Mental Health Services. Available from 10:30 a.m. to 12:30 p.m.
Wednesdays. Safe Refuge, Long Beach-based organization that focuses on alcohol and drug abuse. Available from 10:30 a.m. to 12:30 p.m.
Thursdays. Step Up on Second, a Santa Monica-based organization with a facility on Vine Street in Hollywood that provides housing and mental health services. Available from 11 a.m. to 1 p.m..
Fridays. Friends Community Center in Los Angeles and / or Tarzana Treatment Centers. ‎ Friends provides services for gay and transgender men with drug abuse issues. Tarzana Treatment, based in Tarzana, provides alcohol and drug abuse help. If you are concerned about a community member who is homeless, call the West Hollywood Homeless Initiative Concern Line at (323) 848-6590. If your concern requires time-sensitive assistance during nights or weekends, call the West Hollywood Sheriff’s Station at (310) 855-8850. Additional information about the city’s resources for the homeless is available online. The aggressiveness of these homeless people is getting really bad. Over the past year, I have been verbally assaulted at least 10 times just walking to Rite Aid at Sunset and Fairfax, or to Trader Joe’s at Crescent Heights. I’ve had people get in my face at least three times. Today, a homeless man at the bus stop at Sunset and Crescent Heights stood up as I walked past and demanded my boots. He began cursing and following me and screaming. They need help, no doubt, but at some point a citizen is just going to respond with violence. To be real, Homeless are a burden to City Politics, and however words are coached to sound like care and concern, it is more like (ship them out of my town). I have no correct solution, however I did notice in the months before DEC, the homeless (I feel for them) got worse due to numbers and the hostility, violence (one neighbor told me a homeless man kicked here little dog for no reason). I saw it get so bad, that a few actually thought and approached me and my dog (never happens …. He is the most frightening looking dog — sweet as sugar — but does not like homeless people and his bark is a roar that would make anyone with bad intent ever approach me). I spoke with the manager of the Chamberlain hotel that there was a major crime increase. She blew me off, and a few days later, someone (I assume a homeless person) climbed over a hotel guest balcony and broke into a guests room who was in bed asleep. CORRECT ARTICLE ABOUT HOMELESS BEING MUCH FEWER IN NUMBER AND LESS AGGRESSIVE. I agree with WeHo-J, the homeless have become my aggressive and Steve Martin is correct, many are at the end of their patience. In addition to the steps to be taken as outlined in this article, another thing that would help would be to shut down the recycle center at the Pavilions parking lot. I live in the neighborhood behind the market and this facility as been a magnet for the homeless. The city residents already recycle as Athens has designated bins just for recyclable materials. The number of homeless in and around our area has grown significatnly since this center was placed at Pavilions. In addition to the increase in aggressive homeless hanging out at this facility, we also have shopping carts dumped in our neighborhood and an increase in trash left behind. I know Councilmember Duran addressed this facility in a meeting a month or so ago and he stated he would look into steps on closing this facility. It couldn’t come fast enough for me and my neighbors. It is good to hear all the positive feedback. This is a complex issue and many are at the end of their patience. While many homeless try to be as invisible as possible, others have been aggressive and confrontational which is starting to impact the public’s perception regarding the safety of Santa Monica Blvd. Having packages left on your doorstep has become increasingly dicey as has other types of crimes such as auto break-in’s and laundry room theft. Particularly on the residential streets near La Brea, street crime has made residents fear for their safety. This announcement does not break any new ground. We need to make this a City wide priority rather than the typical approach where the City does a study, holds a few meetings and little changes. We need to set goals and have regular progress reports on crime stats and levels of participation in our homeless programs. If we can’t stay focused beyond a few months, nothing will change. The best evidence of the City’s commitment will come at budget time. That is where the real priorities are revealed. Having started and run a nonprofit to support homeless youth and mothers 20-years-ago–California WISH (Working In Supporting the Homeless)–I can tell you first hand that it is highly complex, as Planck states. And she’s right. Often times, it’s multiple issues that one homeless patron is dealing with (e.g. mental health, high cost of medical bills, addiction, employment, lack of job skills, high cost of rent, etc.). I’ve also come across patrons who just like the freedom that the streets provide; there are no obligations. All that said, I’m grateful to see that the 6 organizational partnerships are supporting West Hollywood in this way. But, the hours are too short. Also, do the homeless patrons even know of the dates/times of their availability? Outreach is critical to the success of any program. I’ve seen solid work come from the LGBT Center and have seen their team members canvassing the streets and providing patrons with information for the myriad resources. I support this. However, in addition to the open arms aspect of helping, there also need to be some tough love. In the last two years, homeless panhandling has become increasingly aggressive. I was cornered one afternoon in the pavilions parking lot by an extremely aggressive guy who would not take no for an answer. That same day, two other overly assertive homeless approached me inn the same parking lot as I exited the store. This issue needs to be addressed.